1. 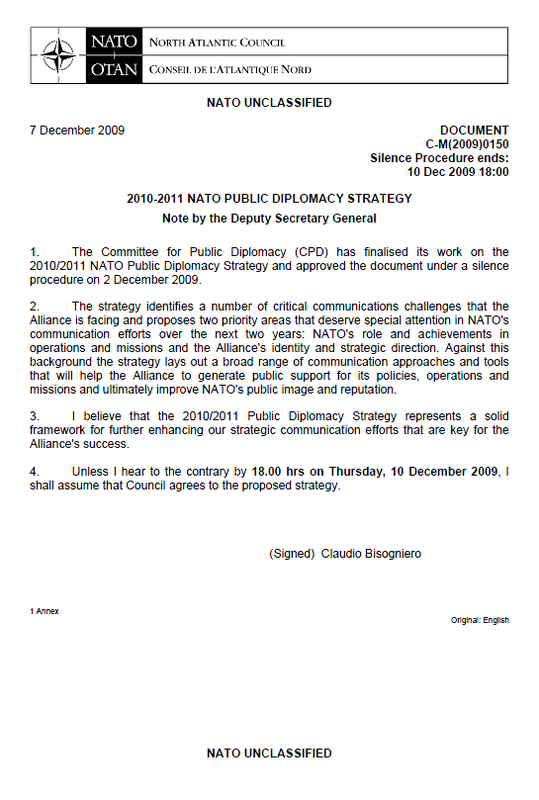 The Committee for Public Diplomacy (CPD) has finalised its work on the 2010/2011 NATO Public Diplomacy Strategy and approved the document under a silence procedure on 2 December 2009. 2. The strategy identifies a number of critical communications challenges that the Alliance is facing and proposes two priority areas that deserve special attention in NATO’s communication efforts over the next two years: NATO’s role and achievements in operations and missions and the Alliance’s identity and strategic direction. Against this background the strategy lays out a broad range of communication approaches and tools that will help the Alliance to generate public support for its policies, operations and missions and ultimately improve NATO’s public image and reputation. 2.1. The current transatlantic environment will continue to challenge NATO’s ability to carry its messages proactively and engagingly to diverse audiences across the globe, but it also entails a number of positive trends on which NATO’s future communication efforts should build. From a broader perspective, the public climate in Europe and North America has recently become more supportive of a close transatlantic security relationship compared to previous years. As the 2009 Transatlantic Trends survey shows, the Alliance has regained public support in many, albeit not all Allied countries. Moreover, NATO’s 60th anniversary, the NATO Summit in Strasbourg/Kehl, the arrival of a new Secretary General in late summer and the launching of a public debate about NATO’s new Strategic Concept have spurred broader public attention and interest in the Alliance. 2.2. But notwithstanding growing European and North American support for transatlantic security cooperation, the public in NATO nations remains highly concerned with the situation in Afghanistan. Compounding the effects of an increasingly challenging security situation, a lack of good governance and the damaging fraud of the recent elections, is the continuing struggle to counterbalance this with effective communications of significant progress across a wide range of areas in the country. As a result, misunderstanding about the real status of mission progress is evident amongst key International Community partners and within some ISAF member nations. The prevailing wish among the public in many European countries is to see the number of their troops reduced or to have them entirely withdrawn, since they fail to see a credible political perspective in Afghanistan. Given the growing number of NATO casualties in the country, large majorities in Europe oppose the use of military ‘hard’ power in general, and consequently of combat troops in Afghanistan. Furthermore, public interest in the Alliance’s successful operations in the Balkans and in combating terrorism in the Mediterranean remains limited, thus adding to doubts about the Allies’ resolve in providing security and stability beyond NATO’s borders. 2.3. In general, as social and economic security has increasingly replaced national security as a major public concern, interest in and understanding of the Alliance’s roles and policies have become significantly weaker. National and international surveys continue to demonstrate that the post-Cold-War generation knows very little about NATO’s concrete activities and its raison d’être as well as the transatlantic values that NATO stands for. The lack of appreciation for the Alliance often coincides with stereotypes and misperceptions of it in broader parts of the public in both Allied and partner countries. Hence explaining NATO’s strategic rationale to the public at large, and specifically to young audiences, must remain a top communication priority in the future in order to strengthen NATO’s identity and reputation. Ultimately, we need to convince our public that the Alliance is relevant to their security concerns and pursues an effective strategy to meet current and future security challenges in close co-ordination with other international organisations. 3.1. Explaining the values and principles that NATO stands for, first and foremost the principle of Allied solidarity, will feature prominently in NATO’s communication and outreach efforts, in particular towards the young generation. In 2010-2011, PDD will pro-actively support the Alliance’s policies across the transformation agenda and towards partner countries, international organisations and international actors. Within the broad spectrum of themes and messages that NATO will communicate in the next two years, a special emphasis will be given to two priority areas that deserve a dedicated effort. 3.2. The successful execution of the Alliance’s objectives in Afghanistan depends on strong public support in NATO nations. To counteract declining support and lack of understanding for the ISAF operation and NATO’s wider engagement in Afghanistan, NATO will increase its efforts to acquaint audiences in Member countries, and where possible partner and troop-contributing nations, with the full range of the Alliance’s roles and activities in Afghanistan. It will aim to explain why the success of these efforts matters at home and what more is needed to succeed, with a view to generating support for NATO’s continued engagement in order to achieve a successful transition, where the Afghan authorities will assume full responsibility for protecting their country’s citizens. Ultimately, NATO’s strategic communication efforts should help shape a clearer public understanding that the Allies remain fully committed to the ISAF operation until all requirements for the successful transition to Afghan ownership and leadership have been met in both military and civilian spheres. 3.3. Building on NATO’s current media operations and public diplomacy efforts in support of the operation in Afghanistan, NATO will pursue more targeted and expanded communication activities to generate broader and more comprehensive reporting on what NATO’s operation has already achieved in Afghanistan in all relevant areas, and in particular in the field of training the Afghan security forces. In order to counter continued misperceptions and doubts about the success of NATO’s engagement, a stronger narrative will be elaborated to explain to our public that the Alliance and the international community need to stay engaged in Afghanistan, not only to provide support for stability and reconstruction in the country but primarily for the sake of our own security. NATO’s new narrative should stress that the way forward is linked to the development of conditions allowing for the successful transition to Afghans taking the lead, which NATO will continue to support in multiple ways, and in particular through the NATO Training Mission – Afghanistan (NTM-A). The narrative will have to be resilient and robust, especially against undermining and adverse events. 3.4. Consequently, NATO’s communication activities will focus on making its concrete support for Afghan capacity-building known to the wider public, including through visual material. Moreover, in order to demonstrate the importance of the regional dimension of NATO’s engagement in Afghanistan, we will increasingly explain the Allies’ evolving relationship with Pakistan, which is based on a three-pronged strategy. Last but not least, NATO will expand its programmes to explain that NATO’s military and civilian engagement is embedded in a wider international effort, and that the Allies remain committed to improving cooperation with other international organisations/actors and partners as part of the Comprehensive Approach. 4.1. Building renewed understanding and support for the transatlantic Alliance among the young generation of Europeans and North Americans is vital for NATO. Our emphasis should be on explaining what NATO concretely does and will continue to do in the years to come to meet current and future security challenges. Likewise, we should stress the continued importance of transatlantic values as well as the benefits of addressing the multifarious threats and challenges to our security within a multilateral, transatlantic framework. The latter implies that PDD and Allied nations should jointly develop and apply a dedicated narrative for young people in a modern and appealing language. 4.2. In 2010, PDD projects such as Summit-related Youth Forums, the NATO-Afghan Student Forum, established summer schools and university courses, conferences, workshops for students, essay and film competitions as well as NATO-sponsored online discussions will be merged under a unified brand called ‘Young Network NATO’, which will allow NATO to engage these audiences in a more systematic and sustained fashion. ‘Young Network NATO’ will have professionally designed web modules, including links to the Secretary General’s Corner, on Facebook, Linked-In and other social media, and will regularly offer reports about upcoming events, NATO stories, as well as a portal for online discussions. 4.3. Wherever possible, NATO will seek to give young political leaders a prominent role in discussing NATO and its policies directly with the Secretary General, senior civilian and military NATO representatives and Alliance leaders. The 2010 NATO Summit, forthcoming ministerial meetings as well as the discussion about a new Strategic Concept are excellent opportunities to demonstrate that NATO is keen to take the views of young audiences on board, be it though special events or web-based programmes that can be linked to NATO meetings. 4.4. Generating broader interest in NATO among young people will only be successful if their school education includes background information on transatlantic security issues and educators have sufficient knowledge of and material on NATO. To this end, NATO will work closely with the respective national authorities and the Atlantic Treaty Associations (ATAs) to engage educators through special programmes such as summer schools and virtual training programmes for educators, and to identify the best ways to improve curricula at schools. The NATO Defence College and the NATO School in Oberammergau will be invited to join this particular outreach effort towards educators. 4.5. NATO will continue to survey and monitor public trends in Member and partner nations to be able to identify the most important and suitable target audiences in the respective countries. Taking into account the specifics of the political and public environment in each country, NATO programmes will aim to be as tailored and efficient as possible. Prime movers of information such as political leaders, parliamentarians, think-tankers, security experts, journalists, academics and representatives of influential NGOs will be first on NATO’s list of target audiences across Allied and partner countries. In particular, PDD will seek to reach out to critical voices as well as to young women who, according to the results of the focus study conducted in 2008, represent an important target group for NATO. In addition, PDD will use new media applications to reach out to broader segments of the public.